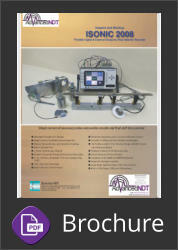 The ISonic 2008 a portable high specification Ultrasonic Flaw Detector with 8 independent test channels. 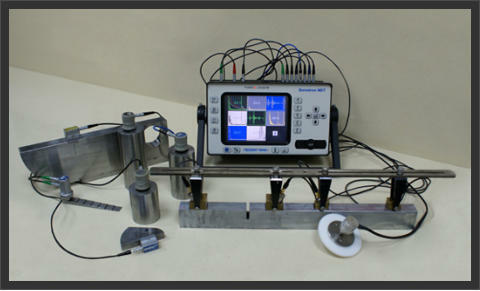 Inspect with up to 8 transducers simultaneously e.g. bracelet scanners. A-Scan, B-Scan, CB (projection C-Scan for inaccessible areas), TOFD and strip chart presentations. The Sonotron ISonic 2008 - Portable 8-Channel Digital Ultrasonic Flaw Detector & Recorder Inspect and Backup Simply connect all necessary probes, position the encoder and fit into the scanner • Affordable Portable AUT Solution •Single Channel and Multi-Channel Inspection • Manual, Semi-automatic, and Automatic Scanning • Built-In Encoder Port· 2 Probe Terminals per Channel • Parallel / Sequential Pulsing Receiving and Recording • A-, B-, CB-Scan, Amplitude / TOF and Coupling Strip, TOFD • 100% Raw Data Recording •Built-In Remote Control Feature • Enhanced Signal Evaluation for Live and Frozen A-Scans • Corrosion Profiling and Flaw Detection and Imaging • Up To 20m Length of One Standard Single or Multi-Channel Record • Playback A-Scans for All Recorded Data • Defect Sizing and Pattern Analysis • Compliance with ASME and RBIM Procedures • Huge Data Storage Capability • Large Bright High Resolution Colour Touch Screen • Built-In VGA Output, USB and LAN Interface ISONIC 2008 uniquely combines functionality and mobility of high performance portable digital ultrasonic flaw detector with recording, imaging, and data processing capabilities of smart computerized multi-channel inspection system. ISONIC 2008 resolves a variety of ultrasonic inspection tasks: • A-Scan-based inspection using conventional pulse echo, back echo attenuation, and through transmission techniques • Single Channel Straight Line Scanning and Recording: o Thickness Profile B-Scan imaging and recording is performed through continuous capturing of wall thickness readings along probe trace o B-Scan cross-sectional imaging and recording of defects for longitudinal and shear wave inspection is performed through continuous measuring of echo amplitudes and reflectors coordinates along probe trace o CB-Scan horizontal plane-view imaging and recording of defects for shear, surface, and guided wave inspection is performed through continuous measuring of echo amplitudes and reflectors coordinates along probe trace o TOFD Inspection – RF B-Scan and D-Scan Imaging • Multi-Channel Straight Line Scanning and Strip Chart Recording: o Multi-Channel Thickness Profile B-Scan imaging and recording is performed through continuous capturing of wall thickness readings along probes trace o Multi-Channel Combined TOFD and Pulse Echo Weld Inspection and Recording is performed through continuous capturing of TOFD RF A-Scans and pulse echo channels amplitudes and reflectors coordinates along probes trace parallel to the weld o Multi-Channel Pulse Echo Flaw Detection for shear, surface, and guided wave inspection is performed through continuous measuring of echo amplitudes and reflectors coordinates along probes trace o etc. For Single and Multi-Channel Straight Line Scanning and Recording it may be used: o Time-based mode (built-in real time clock) o True-to-location mode (built-in incremental encoder interface) • XY-Scanning and Recording with C-Scan and B-Scan imaging is also possible if using optional USB interface to multi-axis mechanical encoder and appropriate software package. For all types of Straight Line Scanning and XY-Scanning records A-Scans are captured for each probe position along probe trace and may be played back and evaluated off-line at post-processing stage. This unique feature makes it possible off-line defect characterization through echo-dynamic pattern analysis. Thickness Profile B-Scan Data recorded during Straight Line Scanning is presented in the format compatible with various Risk Based Inspection and Maintenance procedures. ISONIC 2008 has practically unlimited capacity for storing of: • Single A-Scans accompanied with corresponding instrument settings • Ultrasonic signal spectrum graphs (FFT) accompanied with corresponding RF A-Scans and instrument settings • Various A-Scans sequence records along with corresponding Thickness Profiles, B-Scans, CB-Scans, TOFD Maps, strip charts depending on mode of operation selected; each record is accompanied with corresponding instrument settings. The Sonotron ISonic 2008 - Portable 8-Channel Digital Ultrasonic Flaw Detector & Recorder Inspect and Backup Simply connect all necessary probes, position the encoder and fit into the scanner • Affordable Portable AUT Solution •Single Channel and Multi-Channel Inspection • Manual, Semi-automatic, and Automatic Scanning • Built-In Encoder Port· 2 Probe Terminals per Channel • Parallel / Sequential Pulsing Receiving and Recording • A-, B-, CB-Scan, Amplitude / TOF and Coupling Strip, TOFD • 100% Raw Data Recording •Built-In Remote Control Feature • Enhanced Signal Evaluation for Live and Frozen A-Scans • Corrosion Profiling and Flaw Detection and Imaging • Up To 20m Length of One Standard Single or Multi-Channel Record • Playback A-Scans for All Recorded Data • Defect Sizing and Pattern Analysis • Compliance with ASME and RBIM Procedures • Huge Data Storage Capability • Large Bright High Resolution Colour Touch Screen • Built-In VGA Output, USB and LAN Interface ISONIC 2008 uniquely combines functionality and mobility of high performance portable digital ultrasonic flaw detector with recording, imaging, and data processing capabilities of smart computerized multi- channel inspection system. ISONIC 2008 resolves a variety of ultrasonic inspection tasks: • A-Scan-based inspection using conventional pulse echo, back echo attenuation, and through transmission techniques • Single Channel Straight Line Scanning and Recording: o Thickness Profile B-Scan imaging and recording is performed through continuous capturing of wall thickness readings along probe trace o B-Scan cross-sectional imaging and recording of defects for longitudinal and shear wave inspection is performed through continuous measuring of echo amplitudes and reflectors coordinates along probe trace o CB-Scan horizontal plane-view imaging and recording of defects for shear, surface, and guided wave inspection is performed through continuous measuring of echo amplitudes and reflectors coordinates along probe trace o TOFD Inspection – RF B-Scan and D-Scan Imaging • Multi-Channel Straight Line Scanning and Strip Chart Recording: o Multi-Channel Thickness Profile B-Scan imaging and recording is performed through continuous capturing of wall thickness readings along probes trace o Multi-Channel Combined TOFD and Pulse Echo Weld Inspection and Recording is performed through continuous capturing of TOFD RF A-Scans and pulse echo channels amplitudes and reflectors coordinates along probes trace parallel to the weld o Multi-Channel Pulse Echo Flaw Detection for shear, surface, and guided wave inspection is performed through continuous measuring of echo amplitudes and reflectors coordinates along probes trace o etc. For Single and Multi-Channel Straight Line Scanning and Recording it may be used: o Time-based mode (built-in real time clock) o True-to-location mode (built-in incremental encoder interface) • XY-Scanning and Recording with C-Scan and B-Scan imaging is also possible if using optional USB interface to multi-axis mechanical encoder and appropriate software package. For all types of Straight Line Scanning and XY-Scanning records A-Scans are captured for each probe position along probe trace and may be played back and evaluated off-line at post-processing stage. This unique feature makes it possible off-line defect characterization through echo-dynamic pattern analysis. Thickness Profile B-Scan Data recorded during Straight Line Scanning is presented in the format compatible with various Risk Based Inspection and Maintenance procedures. ISONIC 2008 has practically unlimited capacity for storing of: • Single A-Scans accompanied with corresponding instrument settings • Ultrasonic signal spectrum graphs (FFT) accompanied with corresponding RF A-Scans and instrument settings • Various A-Scans sequence records along with corresponding Thickness Profiles, B-Scans, CB-Scans, TOFD Maps, strip charts depending on mode of operation selected; each record is accompanied with corresponding instrument settings.